This recipe card is such a great example of expectations. And by that I mean that when it was written down, the expectation was that the recipient knew how to put a cookie dough together. What order the ingredients are mixed, what processes are used, what her oven should to be heated to in order to bake the perfect cookie. And most of all, how to use her sense of site and touch to ensure the proper amount of flour has been added. The only instructions on the recipe card read, “Dissolve the soda in a little warm water. Add vinegar to soda. Let it foam well. Then add to dough & flour to make stiff dough. Roll & bake.” And if you didn’t notice, there was no amount for the flour given. 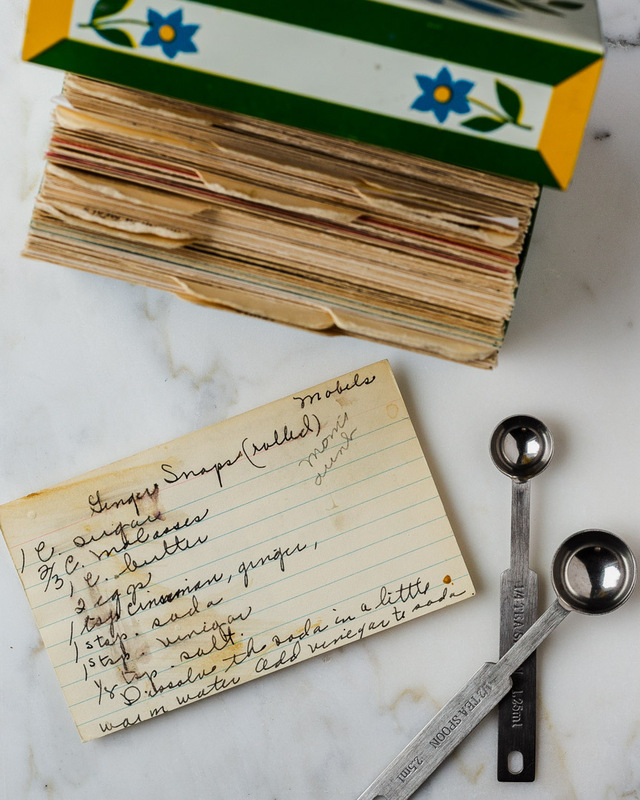 Since I can’t call my grandma or my great aunt for advice, I turned to math – yes, you will use it in real life – and my handy-dandy reference book, Ratio by Michael Ruhlman, to help me determine the proper amount of flour based on the fat and sugar in the recipe. Using the standard creaming method to start the dough was pretty straight forward. I also figured that Great Aunt Mabel probably sifted the flour, cinnamon, ginger, and salt together. So that’s what I did. But then came the dissolving of the soda and adding the vinegar. The instructions were clear and I had run across this in another cookie recipe so I wasn’t too put off. I just wasn’t sure why it made a difference. After a little research, I discovered that when used by itself, baking soda creates carbon dioxide gas – that’s what helps to leaven the cookie – and sodium carbonate aka washing soda. And, yes it leaves a soapy aftertaste. BUT, when you add an acid – vinegar in this case – the carbon dioxide is created faster and the soapy aftertaste is significantly reduced. Yay! 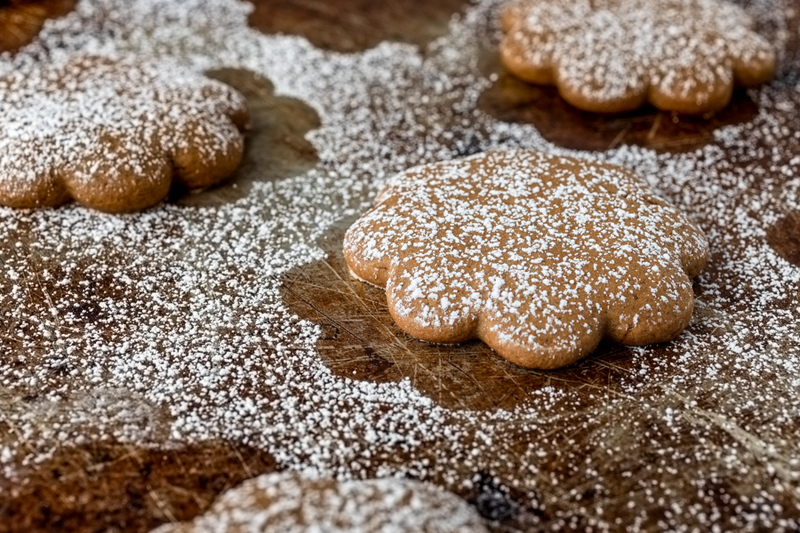 Great Aunt Mabel may not have been a chemist, but she knew how to make a tasty, light cookie! So often we take for granted the people that surround us. And it isn’t until they are gone that we realize we have forgotten to ask them so many things. And when it comes to family recipes, it is much the same. We knew that grandma would bring her 2 Hour Rolls for Thanksgiving and that there would always be a Lime Jell-o Salad at the church potluck courtesy of Aunt Mertle. 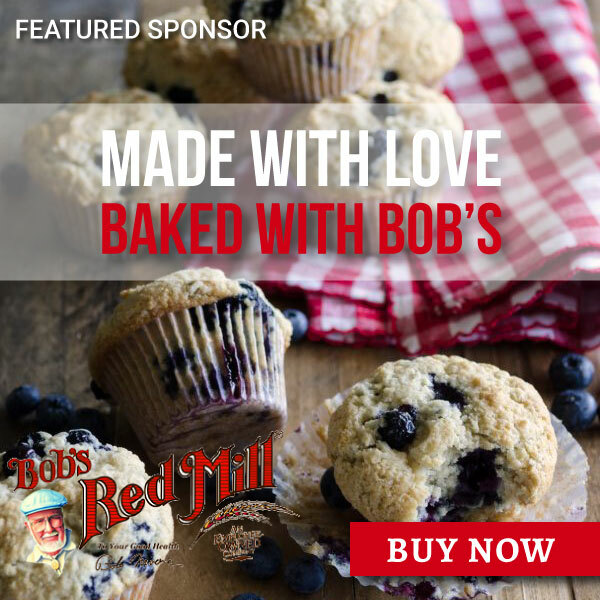 What we didn’t consider is that when they were no longer here to share those dishes, their knowledge of the best-way-to…, or the you-should-never…, or the I-always-use-this-brand…, or the this-is-how-the-dough-should-feel… is taken from us as well. So, if I had it to do again, here are the things that I would have asked my grandma. Why do you dissolve the soda in the water before you add it to the dough? How do you know when you have added enough flour? How thick should I roll out the cookies? How do you roll out the dough so evenly? 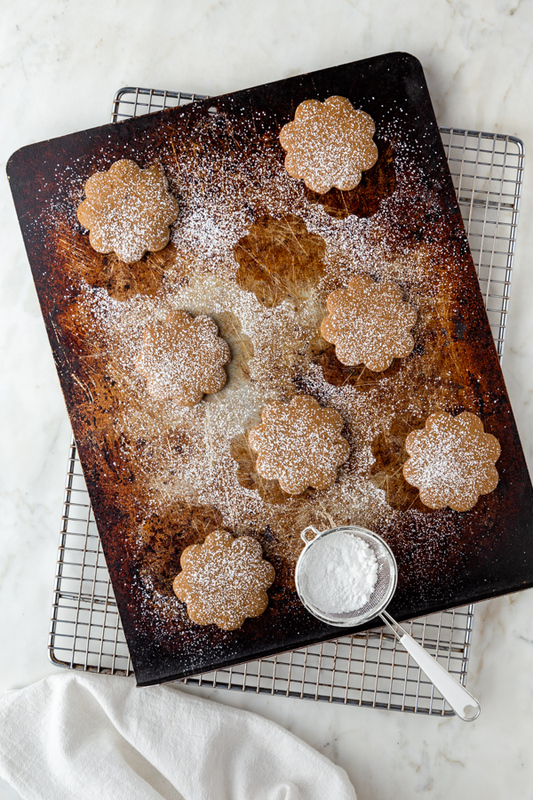 What is your favorite shape to use then you make these cookies? What temperature should I bake the cookies at? How long do they need to bake? And as the cookies baked, I would sit with her at the kitchen table and ask, “Grandma, what is your favorite part of being a mother?” And I imagine that there would be many stories about my dad, and aunts, and uncle, and cooking. I am sure that there would be lots of stories about cooking. 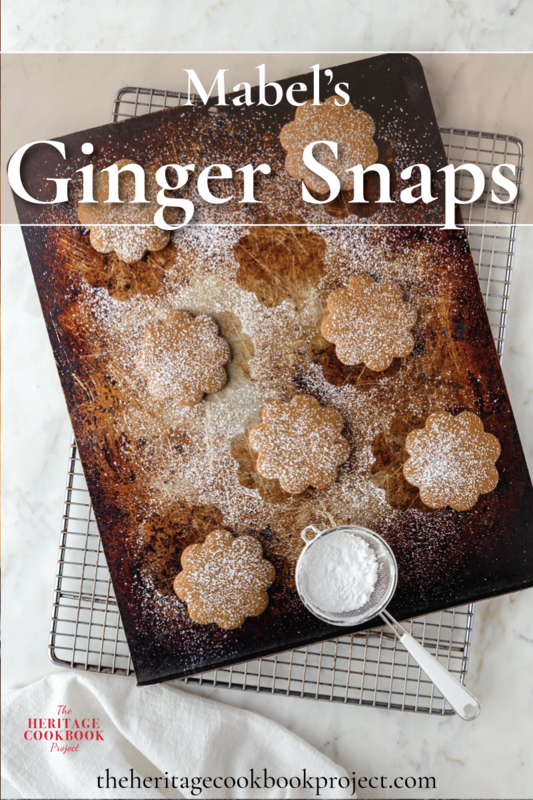 This ginger snap cookie recipe is a heritage recipe handed down by my grandma’s aunt. The cookies are crispy and sweet and have the perfect amount of spice. In a medium bowl, sift together the flour, cinnamon, ginger, and salt and set aside. With a stand mixer or hand mixer on low speed, beat the butter until creamy and whipped. Add the sugar and beat on high until the mixture is pale yellow and fluffy. Scrape down the sides of the bowl periodically. Turn the mixer to low and add the eggs one at a time beating for 20 seconds after each addition. After both the eggs have been added, continue beating for 2 more minutes. Add the soda mixture and flour mixture and mix on low until fully incorporated and a stiff dough is formed. Cut the dough in half, shape into rectangles and wrap and refrigerate for a minimum of 2 hours and up to 8 hours. On a lightly floured surface, parchment paper, or silicone mat, roll the dough out to 1/4” thick. Cut into desired shapes and bake for 8 minutes. If you roll the cookies the parchment or silicone mat, remove the scraps from around the cookies and transfer directly to baking sheet. Hey Jenni, it’s just too bad we don’t have the sense to ask when they around. I’d like to think that Mabel would be proud. And thanks for having such a great resource for baking! What a delicious cookie recipe…reading your what I should have asked Grandma recipe rang so true for me. Oh this resonates with me so much! Have I showed you the pictures of my grandma’s recipes? I wrote down two of them – she didn’t even have measurements. I drew pictures of water glasses she used from her shelves.